There is hardly a more delightfully childish treat than caramel apples. But even adults scramble for the deep, complex flavors of these. Kids love to help dip the apples in the warm caramel, then roll them in their favorite toppings. Try them with nuts, candies, crushed graham crackers, or drizzle them with melted chocolate after they've set. Apples must be thoroughly washed and dried to remove any waxy residue that will prevent caramel from sticking. Apples should also be room temperature, so that caramel doesn't set too quickly. A candy thermometer that is able to measure up to at least 250 degrees in one or two-degree increments is necessary. Craft sticks or lollipop sticks can be purchased at your local craft store. Pierce each apple through its core almost to the bottom with craft sticks, lollipop sticks or chopsticks. Set aside. In a medium saucepan, over medium-high heat, combine brown sugar, butter, sweetened condensed milk, maple syrup, corn syrups, vanilla and salt. Cook, stirring constantly, until the butter melts and mixture comes to a boil. Insert a candy thermometer into the pot (without touching the bottom) and continue to heat, stirring, until temperature reaches 238 degrees, or about 15 minutes. Immediately remove caramel from heat, and pour into a large bowl. When caramel cools to approximately 210 degrees, begin to dip apples, one by one, using the craft stick as a handle. If caramel becomes too firm, you can reheat it gently to loosen it up. 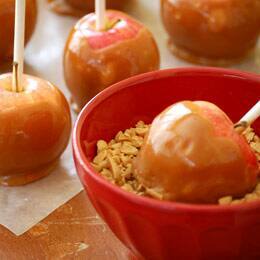 Place the caramel-coated apples on a cooking sheet lined with waxed paper and place in the fridge to cool completely. Cooled apples can then be rolled in nuts or candies if desired.